Alpin Hunter. Device. Vert, a quiver with three arrows argent between three hunting horns argent garnished Or. Archibald Henderson. Device. Azure, on a lion Or between three mascles argent, a mascle azure. Clarice la Costuriere d'Avignon. Name and device. Azure, in pale three keys fesswise, a bordure embattled argent. For example, a name submission cannot use the combinations the Bard of Armagh or Abbot of Saint Giles or Champion of Ealdormere. 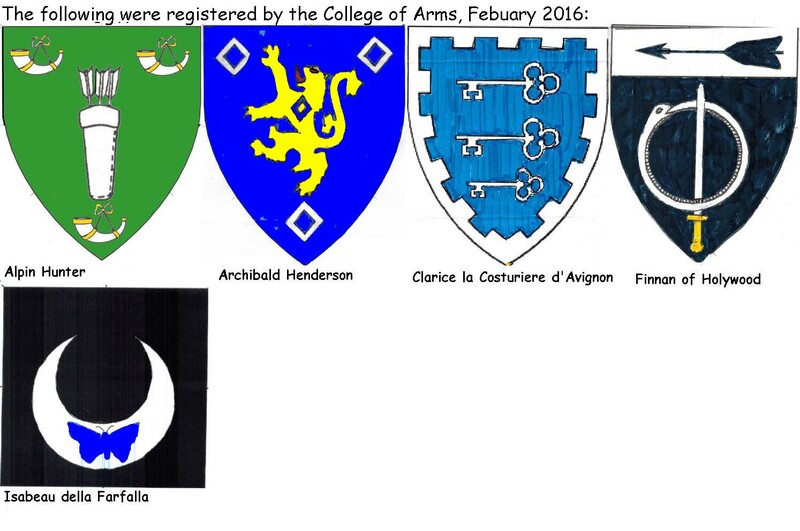 Similarly, while Kingdom, London, and Herald can all be documented as both given names and bynames, Kingdom Marshall, London Herald and Herald of Wyvernwoode all give the impression of claiming rank or official position and would not be registerable. However, the Seamstress of York is unlikely to be understood to be the only seamstress, or an official seamstress and so would be registerable. Therefore, a name meaning "Clarice the dressmaker of Avignon" is similarly not presumptuous. Nice late 13th century French name! Finnan of Holywood. Name and device. Sable, a serpent in annulo vorant of its tail argent and enfiled by a sword proper, on a chief argent an arrow reversed sable. Geoffrey the Grim. Reblazon of device. Gules, a bend argent surmounted by a wivern displayed with head facing to sinister sable fimbriated, in base a cross formy argent. Blazoned when registered, in June 1973, as Gules, a bend argent, overall a wivern displayed head to sinister, tail reflexed behind, sable fimbriated argent, in base a cross patty argent. We no longer use the term patty as it is ambiguous. Gwenhwyfar Morgan Cornubia. Reblazon of device. Per pale argent and vert, in annulo three crosses formy gules and three shamrocks argent. Blazoned when registered in February 1972 as Per pale argent and vert, in annulo to dexter three crosses patty gules and to sinister three trefoils slipped argent, we no longer use the ambiguous term patty. Isabeau della Farfalla. Badge. Sable, on a crescent argent a butterfly azure. Ivan the Astronomer. Reblazon of device. Per fess wavy argent and gules, in canton a cross formy gules. Blazoned when registered, some time around January 1973, as Per fess wavy argent and gules, in canton a cross patty gules, we no longer use the ambiguous term patty. We are unable to find this item on any published LoAR. The O&A lists the registration as January 1973, but there is a letter in the files from Harold Breakstone to Ivan dated February 1972. Sadly, it says nothing of substance. The submission apparently was paid for "On Ioseph's Letter of January 1971", according to a notation on the name form. Jerilyn of Vert Silva. Reblazon of device. Argent, a cross formy within an annulet sable, on a chief triangular vert a unicorn's horn inverted argent. Blazoned when registered in January 1981 as Argent, a cross patty within an annulet sable, on a chief triangular vert a unicorn's horn inverted argent, we no longer use the ambiguous term patty. Kay Gwenhwyfar of Locksley. Reblazon of device. Or, on a Celtic cross formy gules, a rose argent. Blazoned when registered in January 1973 as Or, centered upon a Celtic cross patty gules, a rose barbed and seeded argent, we no longer use the ambiguous term patty. Wilhelm Steinbruch. Reblazon of device. Per pale sable and gules, two crosses formy fitchy and on a chief argent, an eagle gules. Blazoned when registered in January 1986 as Per pale sable and gules, two crosses paty fitchy, on a chief argent an eagle displayed gules, we no longer use the ambiguous term paty.